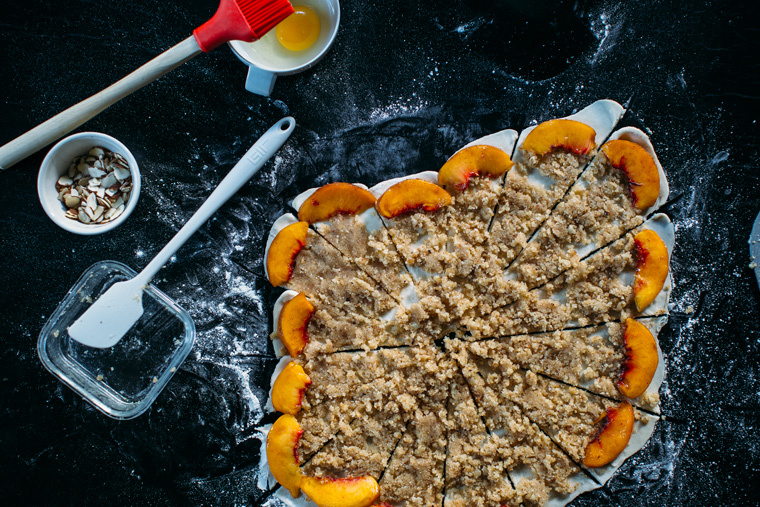 Ok, this is the last peach recipe. 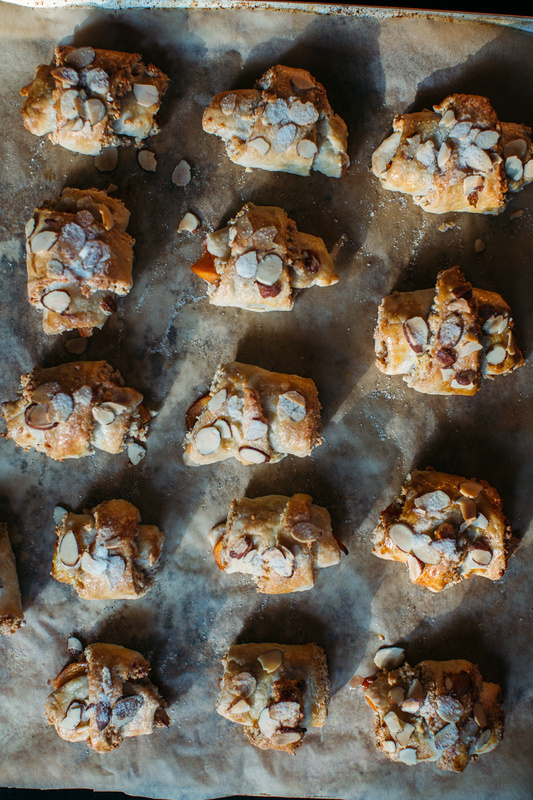 It will be worth suppressing your pumpkin-spice cravings, I promise. And if you’re in a part of the country where peaches are no longer available just simply swap them out for apples here – so good! 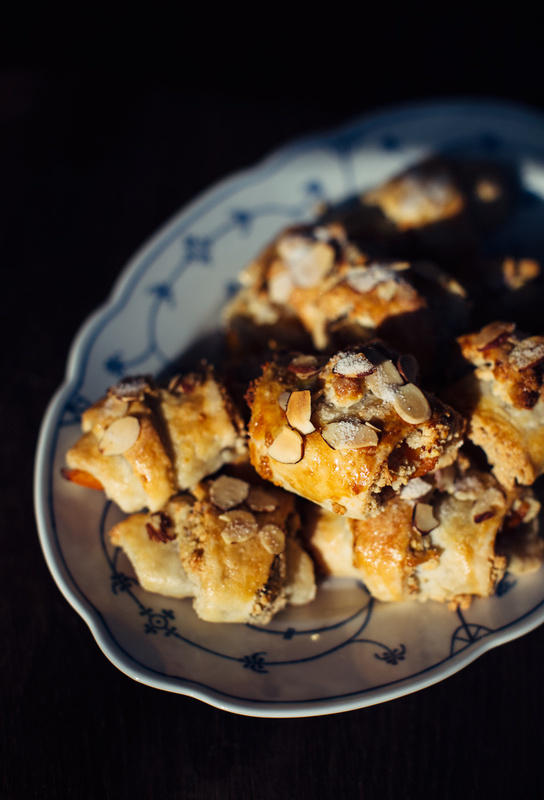 I make these little pastries at least a few times a year. 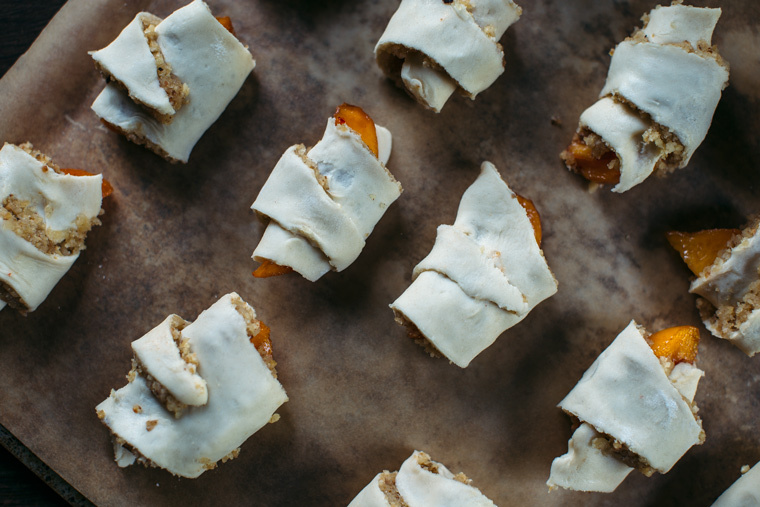 It’s fun to fill them with whatever you have on hand, apricot jam with dark chocolate and ginger, just plain cinnamon and sugar, but my favorite remains this combination with a made-from-scratch almond paste and oh yes… peaches! 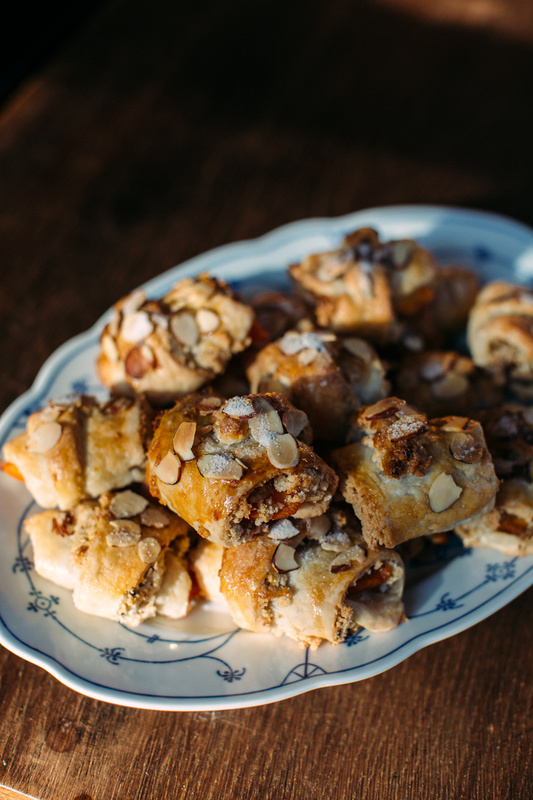 Don’t let the almond paste intimidate you, it’s so easy to make! Blanching them and removing the skins in the only time-consuming part but I find a moment of zen in this activity. 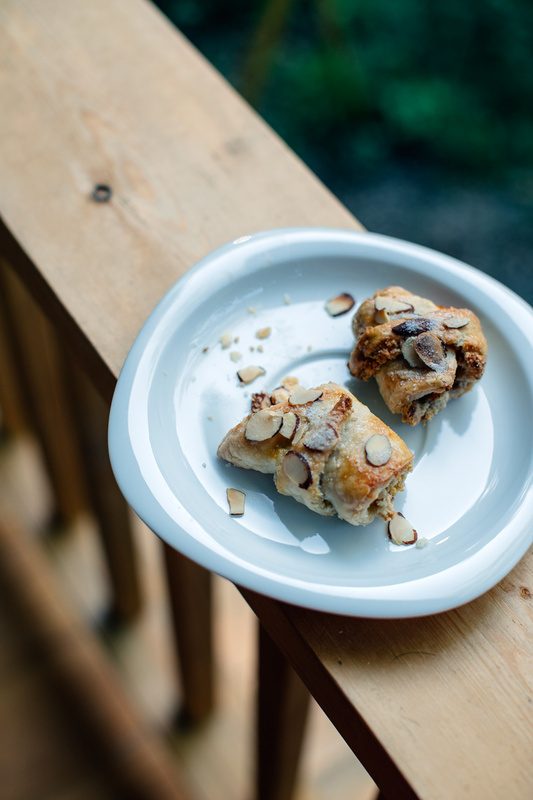 I had these little rugelach all prepped and waiting in the fridge overnight then baked them first thing in the morning. I should probably take advantage of this pretty morning light more often! Mark and I got tickets to a mid-century modern home tour, we’ll be spending the day checking out other people’s houses, I’m excited! It’s probably one of the few times where it’s totally acceptable to be the secret snoop that I am. Hope you all have a good weekend! 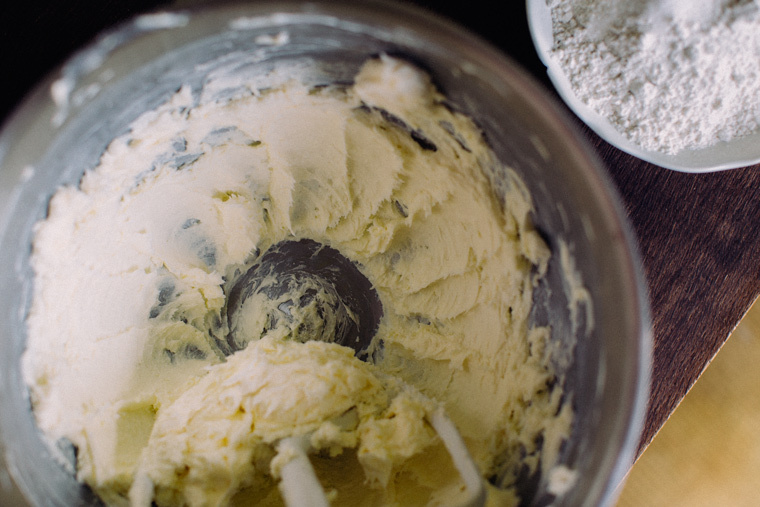 Combine butter and cream cheese until light and fluffy. Add flour, salt and sugar and mix until there are no more patches of flour. Take dough out of mixing bowl and push into a disk. Wrap in plastic wrap and refrigerate for at least two hours, or up to three days. 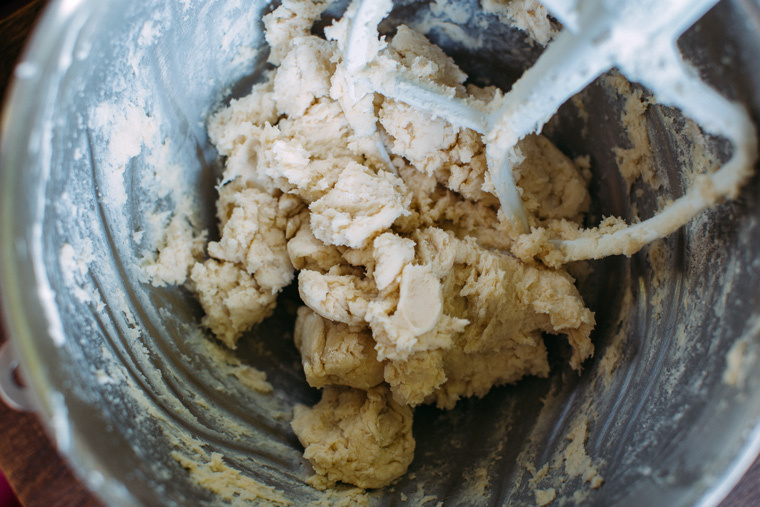 Sprinkle a dry surface with flour to roll dough. Roll dough into a big circle, trying to keep the entire thing the same thickness. 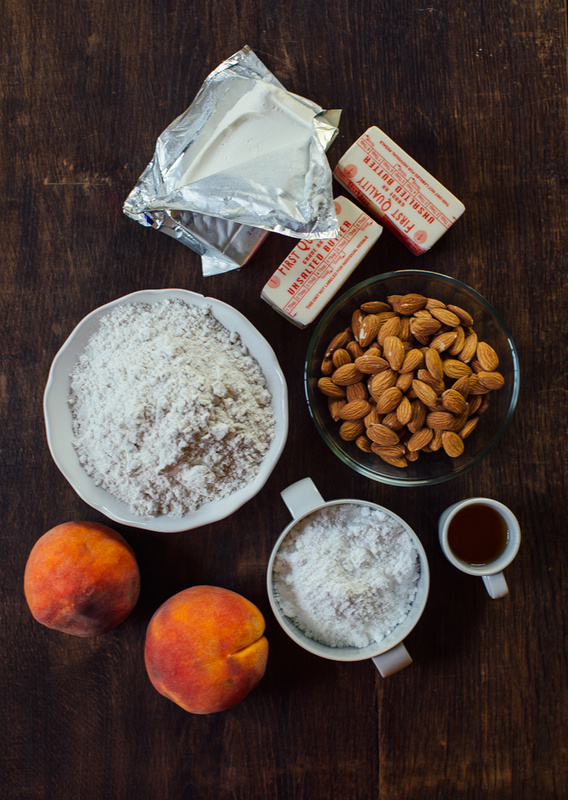 Spread on the almond paste as shown. Cut into even triangles, like you’re cutting a pizza. 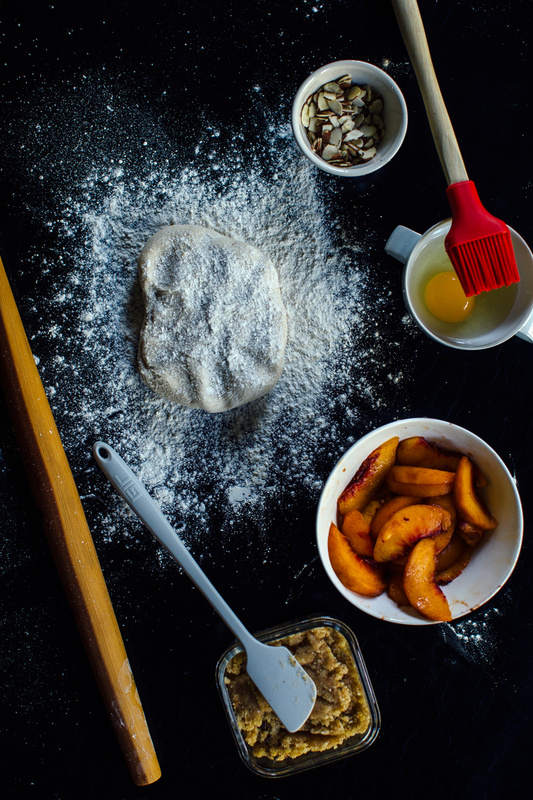 Place a peach slice at the end of each triangle and starting from the peach side roll up the dough around the peach. 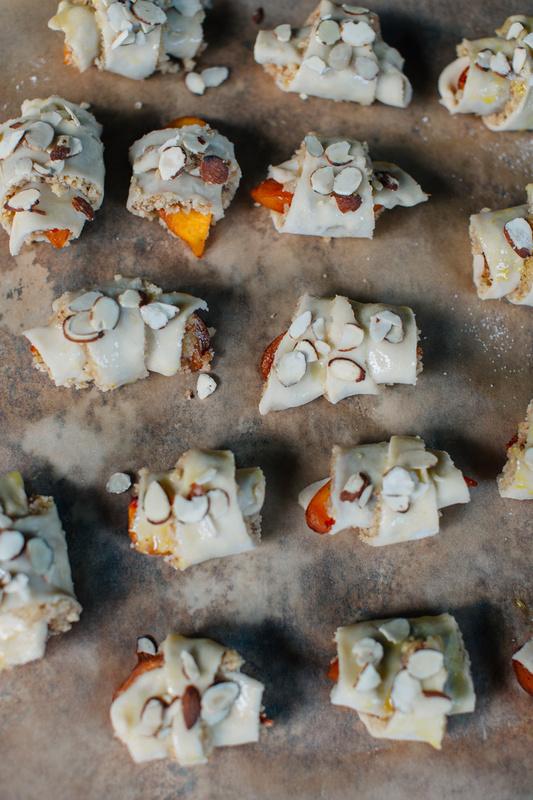 Brush with an egg wash for a shiny look and sprinkle on some sliced almonds and a little pinch of sugar if you like. If you have room in your fridge or freezer it’s best to refrigerate them for a bit before placing into a 350F oven for 25 minutes. 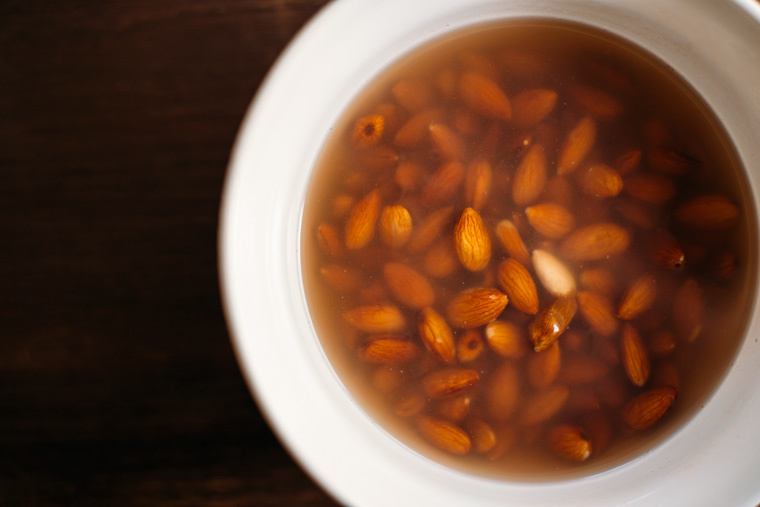 Blanch the almonds: Place almonds in a bowl, pour boiling water over them. 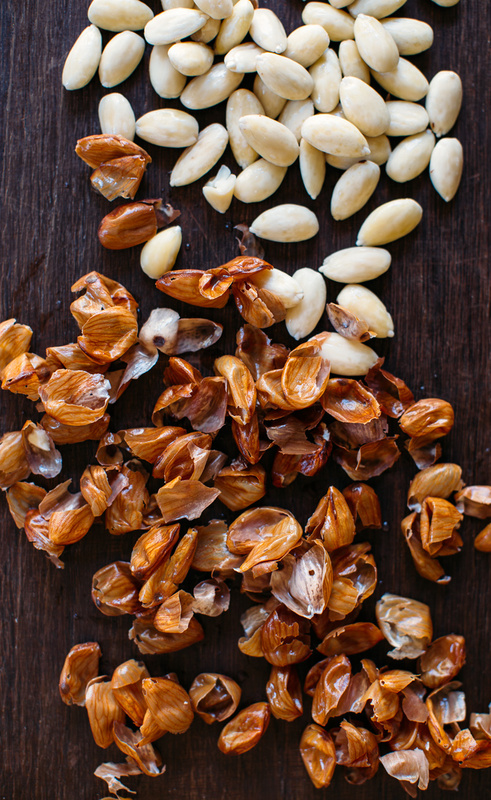 As soon as the almonds are cool enough to touch you can pop their skins right off simply by pinching them! 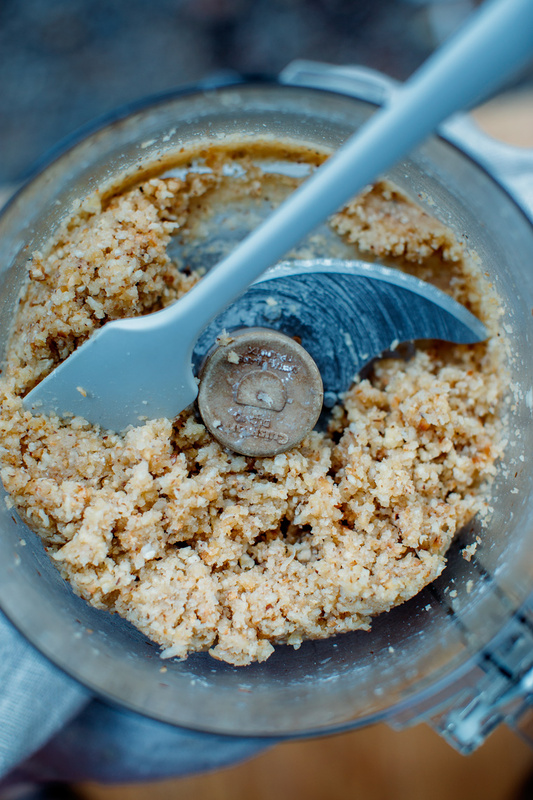 Add all the ingredients for the almond paste into your food processor and blend. This is so impressive!! 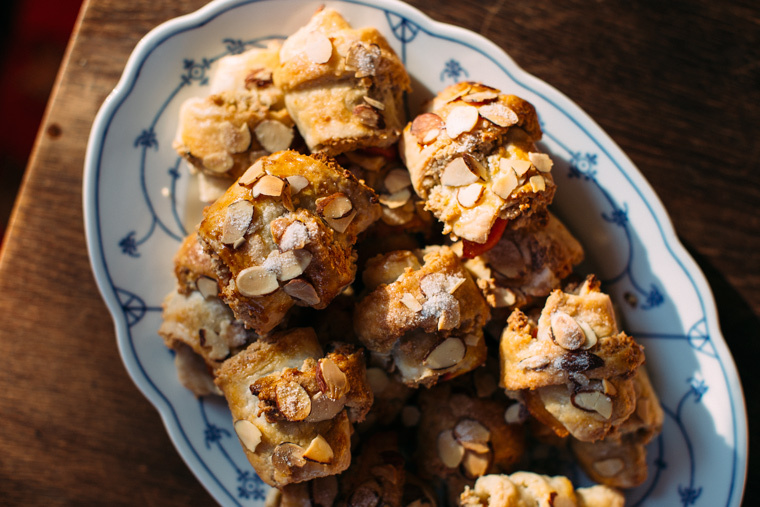 Love the boozy almond paste!